This is the time of year when you usually hear people talking about holiday parties. But, oddly, I'm finding people that many people are enthusiastically planning inauguration parties. "This time, there's really something to celebrate," my friend Ross Taylor said. In D.C., they're planning several days of celebrating, with January 19 to be a work-service day commemorating the Martin Luther King, Jr., holiday. The swearing-in is January 20, but a time is not yet set for the ceremony. Need info? You can sign up for updates at the inauguration website/blog. Rub the rim of a martini glass with lemon, and rim the glass with sugar. 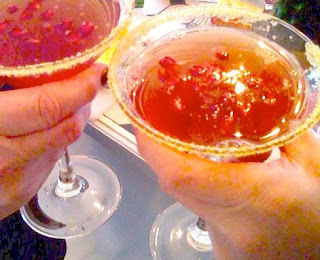 Then fill the glass with 2/3 champagne and 1/3 organic pomegranate juice. Garnish with fresh pomegranate seeds and a twist of lemon.